Combustion is the reaction of a fuel with oxygen to create energy. 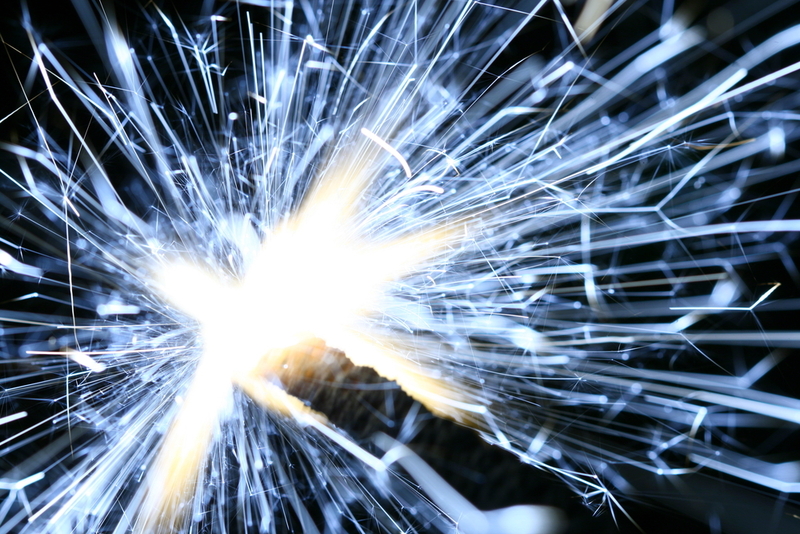 The energy produced by this reaction is used to heat our homes and power our cars. Combustion (or burning, as it is more commonly known) is the reaction between a fuel and Oxygen which can create lots of energy. The Oxygen required for this reaction comes from the air. The air is a mixture of gases. 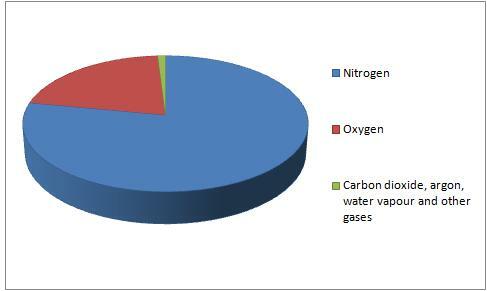 It is mainly composed of: Nitrogen (about 78%), Oxygen (21%) and a small mixture of other gases such as Carbon Dioxide and Argon. 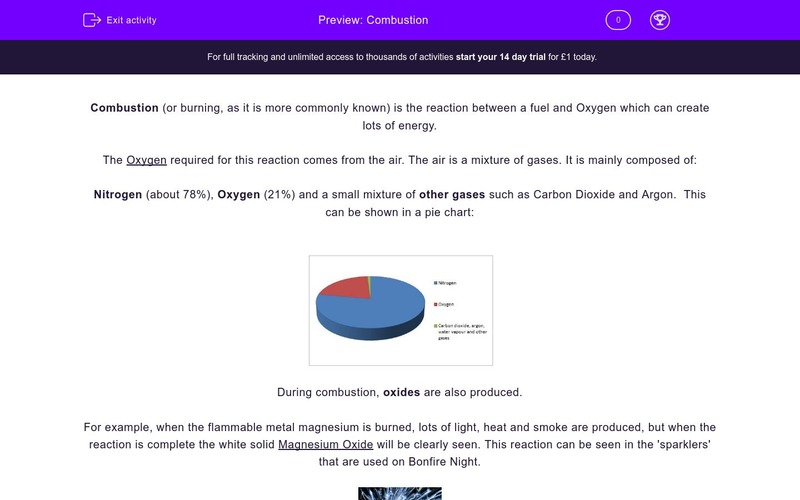 During combustion, oxides are also produced. For example, when the flammable metal magnesium is burned, lots of light, heat and smoke are produced, but when the reaction is complete the white solid Magnesium Oxide will be clearly seen. This reaction can be seen in the 'sparklers' that are used on Guy Fawkes night. Please note that the light, heat and smoke are not included in the chemical (word) equation because they are not chemicals and all combustion reactions are irreversible. Which of the following gases makes up most of the air? Shown on the right is the percentage of air that each gas makes up. Match each of the gases on the left to the correct percentage on the right. Which of the following gases is required for a fuel to burn? Combustion is the reaction of a fuel with oxygen. This reaction produces lots of energy. Which TWO of the following are not powered by the energy produced by the combustion of a fuel? Alcohol is a commonly-used fuel in Brazil to power cars. Alcohol burns with a blue flame to produce lots of heat, Carbon Dioxide and water. Use this information to decide whether each of the substances listed below is a reactant or a product in the reaction. Tick the objects from the list below that could be used as a fuel. Car manufacturers are developing cars that use Hydrogen as a fuel. Hydrogen burns to produce only water and, therefore, doesn't contribute to pollution problems such as acid rain. Use the table below to complete the equation for the combustion of Hydrogen. Air is mostly made up of the unreactive gas nitrogen. Packets of crisps contain 100% nitrogen gas as it doesn't react with the crisps, allowing them to stay fresher for longer. The composition of air varies depending on temperature and altitude. The higher up you go the less oxygen the air contains. Oxygen is required for a substance to burn. The higher the concentration of oxygen the better the fuel will burn. Solar power harnesses energy from the sun and wrist watches use the energy produced by a chemical reaction within the battery. The reactants are the chemicals that react to create one or more new products. A fuel is a substance that burns easily to release lots of energy. Hydrogen is classed as pollution-free fuel, but the production of Hydrogen involves the combustion of fossil fuels, which do contribute to pollution problems (such as acid rain and global warming).